Before we start, I want to make sure you and your partner both listen to this episode, whether together at the same time or separately doesn’t matter. It matters that you both not only are hearers of this episode but doers in a mental mindset shift. 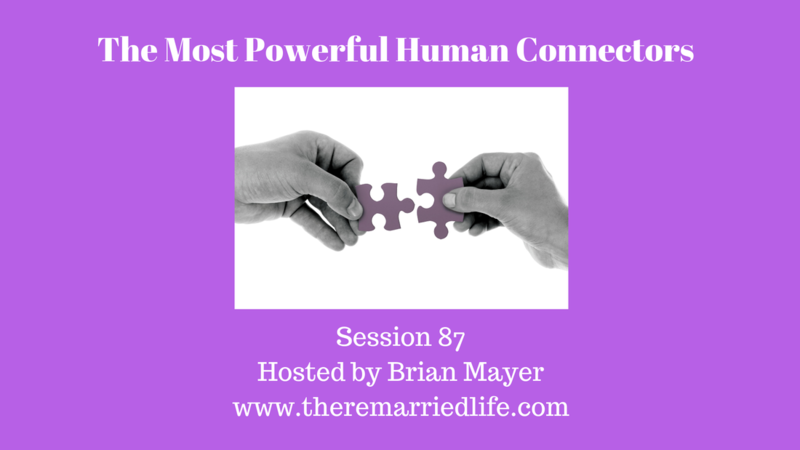 According to a large group of fellow couples therapists that I know, I asked them to tell me in one word what the most impactful human connector is. They gave me so many great answers and we are going to talk about 10 of those today. Vulnerability is exposing yourself in such as way as to be capable of being wounded or hurt or opening yourself up to attack or criticism. Transparency means being open and candid or being easily seen through. Curiosity means being eager to learn. Acceptance means taking or receiving something just the way it is. Compassion means feeling deep sorrow and also combined with a strong desire to lessen the suffering. Mirroring means subconsciously imitating the attitudes of another. This one has a fine line in which great connection can occur or mocking can be felt depending on the genuineness of it. Suffering means to undergo pain or distress and this one is a connector obviously when either one or both in the couple are undergoing stress from outside the relationship such as with a sickness or financial crisis. We. The dictionary definition of this one because it says it is the “plural of I.” I love this because it means while you still maintain the I, there is a togetherness in this word. In my opinion, relationships while they can be healthy and or restored if necessary by doing things like date nights and other quality time activities, there is something so much more powerful to these words that if you can apply them to your daily life in your relationship and family that it help a great deal to give you the marriage of your dreams.